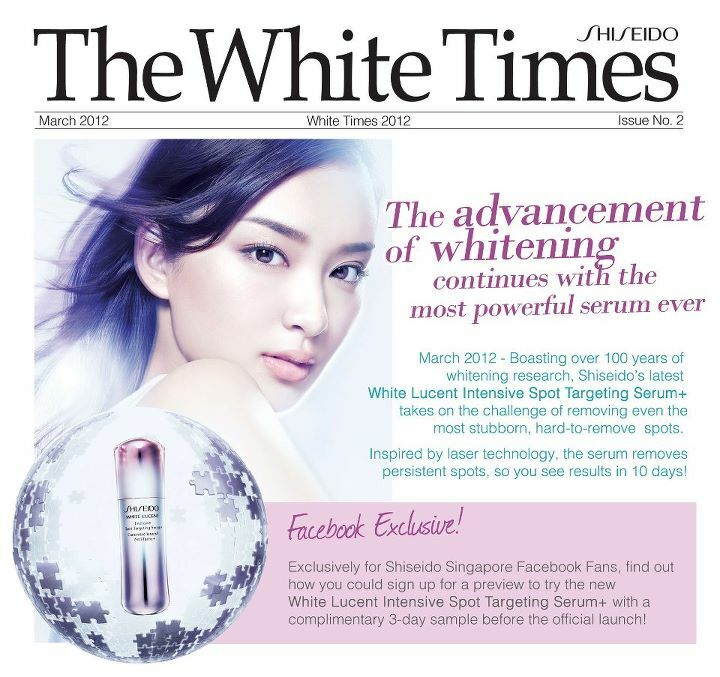 Following Robinsons Whitening Fair started today, Metro is having their White Fair starting tomorrow Mar 1st as well. Until Mar 23rd, though they don't absorb any GST or whatever, you have some GWPs from brands not available in Robinsons (like Pola! ), and some counter parties organized. See below for details. This March's theme is definitely whitening. 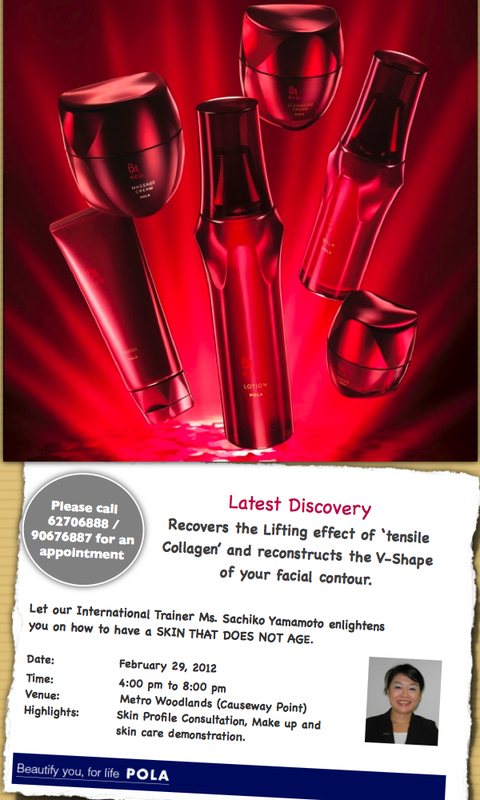 Shiseido has White Day Party at their Tangs counter from Mar 9 to Mar 15. Spend $100 for a full makeover or facial, or $180 for both. Top up your purchase to $350 for limited edition Pure White whitening supplement drink, and daily first 20 customers receive a $20 voucher by purchasing a limited edition must-have brightening set. Afterglow Cosmetics offers free shipping with any order. Valid for Feb 29. Beauty Bar offers a $20 credit on your next beautybar purchase with $50 purchase on Jurlique's bestselling lines. Enter code LEAP at checkout. Valid for Feb 29. Beauty Encounter offers free shipping with any $25 purchase. Enter code LEP358 at checkout. Valid for Feb 29. Burt’s Bees offers free shipping with any $25 purchase. Enter code FREE25 at checkout. Valid for Feb 29. 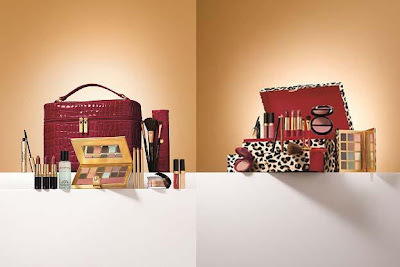 Clarins offers free 7-pc gift including bag with $75 order. Enter code LEAP at checkout. Valid for Feb 29. Clinique offers 3 mini treats with any order. Pick any 3 from 8 Clinique favorites. Shipping is free with any $50 purchase. Valid thru Mar 1. Dermstore offers free Beginning by Maclaren Travel Kit for Baby worth $24 with any $100 purchase. No code needed. While supplies last. E.L.F offers a free mystery gift bag for Leap Year with any $20 purchase, and enter to win a $100 e.l.f. gift card. Enter code LEAP at checckout. Valid thru Feb 29. Elizabeth Arden offers 20% off any purchase. Enter code SPRING20 at checkout. Valid thru Mar 8. Freeze 24-7 Anti-Aging Skincare offers 20% off any purchase. Enter code freeze20 at checkout. Valid thru Mar 7. Juice Beauty offers $5 off $35 with code SAVE5; $10 off $50 with code SAVE10; $20 off $70 with code SAVE20; or $25 off $100 with code SAVE25. Valid thru Mar 1. Mario Badescu offers free shipping and 10% off with any $50 purchase. Enter code LEAP at checkout. Valid for Feb 29. Origins offers free shipping and a deluxe duo of Plantscription Anti-aging serum (1 week supply) and eye treatment (1 month supply) with any purchase. Enter code LEAP at checkout. Valid for Feb 29. Prescriptives offers free shipping and free twin treats with any purchase. Enter code REFRESH for travel size All you need+ SPF15 Moisturizer and All you Need + for eyes; POWER for purse size Super Line Preventor and Intensive Rebuilding Moisturizer; KNOCKOUT for 14 day supply of False Eyelashes Plush Mascara and travel size MAGIC Liquid Powder . Valid thru Mar 1. SkinCareRx offers 29% off with purchase of PMD, Obagi, RivaleSkin, Replenix, M2, La Roche-Posay, and Vivite. Enter code LEAP29 at checkout. Valid for Feb 29. Skyn Iceland offers a free deluxe sample of Pure Cloud Cream worth $19.50 with any $45 purchase. Enter code PCCF28 at checkout. Valid thru Mar 6. Spalook offers 15% off any $65 purchase. Enter code WINNERS at checkout. Valid thru Mar 12. The Body Shop offers 29% off any purchase. Enter code LEAPYEAR at checkout. Valid for Feb 29. TheHairStyler.com offers 15% off with any purchase when you signup. Enter code OSCAR15 at checkout. Valid thru Mar 8. Wei East offers 30% off with purchase of their 'All Star' products. Enter code AllStar at checkout. While supplies last. Made by Beauty's first giveaway is open to worldwide readers =) Join here! Remember I shared about Pola coming to Singapore? 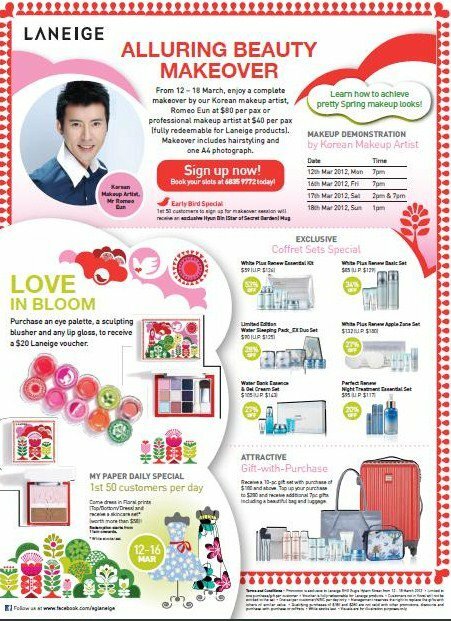 They are offering GWPs with $180 purchase as well, exclusively at Metro woodlands and Metro sengkang, from Feb 29 to Mar 13. In Robinsons Whitening Fair, GST on beauty products are absorbed from Feb 29 to Mar 11. 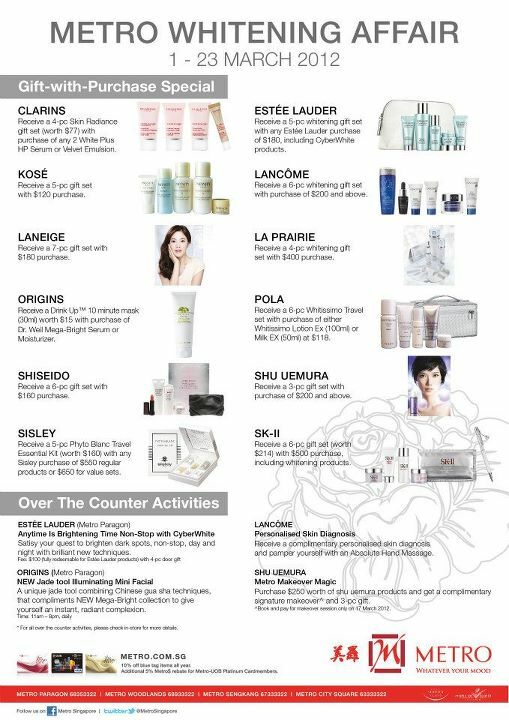 Many brands are offering GWPs as well, including Estee Lauder, Clarins, Clinique, La Prairie, Elizabeth Arden, SK-II, Shiseido, Shu Uemura, Lancome, Dior, Laneige, Kose, Dr. GL, Kiehl's, Origins, M.A.C, Biotherm, Sisley, Fancl, Kenzo, Benefit, Jurlique, Stivectin, Dr.Ci:Labo, Envie De Neuf, Murad, and La Mer. Read the full brochure here. Carol's Daughter offers 20% any order with purchase of membership at $10 (worth $25). Membership gives you 10% off every other order for a year and member only offers. Valid thru Feb 29. Clinique offers free shipping and a free Repariwear Intensive Eye Cream mini with any $30 purchase. Enter code REPAIRWEAR at checkout. Valid today only. Dermstore offers 20% off with any purchase of Dr. Hauschka. No code needed. Valid thru Mar 4. Elizabeth Arden offers free shipping and 5-pc Beauty Gift with any $40 purchase. Enter code 40CERAMIDE at checkout. Top up your purchase to $65 to receive an additional Red chic bag. Enter code 65FEBRUARY at checkout. Valid thru Feb 29. Hautelook is having a Mario Badescu Sale. Jurlique offers free 15ml Moisture Replenishing Day Cream and 15ml Citrus Hand Cream with any $50 purchase. Enter code MOISTURE at checkout. Valid thru Feb 29. L'occitane offers free shipping with any $40 purchase. No code needed. Top up your purchase to $75 to receive a Brighten Up Collection gift worth $44. Enter code SPRING at checkout. La Prairie offers free shipping and a Power Up Trio worth $200 with any $300 purchase. Gift includes deluxe sample of Cellular Power Charge Night, Cellular Power Infusion and Microdermabrasion Cream. Enter code POWERUP2 at checkout. While supplies last. Mark. is having a last chance sale offering savings up to 30% off. While supplies last. NeoStrata offers free Exuviance Ultra Restorative Creme with any $100 purchase. While supplies last. Sally beauty offers save $3 on 2 Beyond the Zone Hair Care Products. Enter code 444688 at checkout. Valid thru Feb 29. Sephora offers free Korres Wild Rose Sleeping Facial sample with any $25 purchase. Enter code WILDROSE at checkout. While supplies last. Sephora offers free Clinique Moisture Surge Intense sample with any $25 purchase. Enter code INTENSE at checkout. While supplies last. Sephora offers free Whipped Cherry Lip Saver with any $25 purchase. Enter code CHERRY at checkout. While supplies last. Skin One offers 15% off with any order. Enter code EMAIL15 at checkout. Valid for today only. 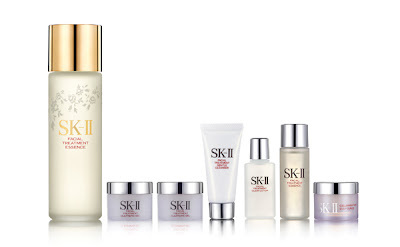 SkincareRx offers a free $30 eGift card with any $125 purchase. Enter code 30EGIFT at checkout. Valid thru Feb 29. Smashbox is having a Beauty Blowout Sale for up to 30% savings and free shipping with any purchase. While supplies last. Time to Spa offers $2.14 shipping with any order, and free Elemis Skin Booster Boot Camp worth $75 with any $75 order. Enter code LOVEMYSKIN at checkout. Valid thru Feb 29. ZENMED offers $5 off with any purchase of Skin Support for Dry Skin. Enter code GCJC162E7E5 at checkout. Valid thru Mar 2. 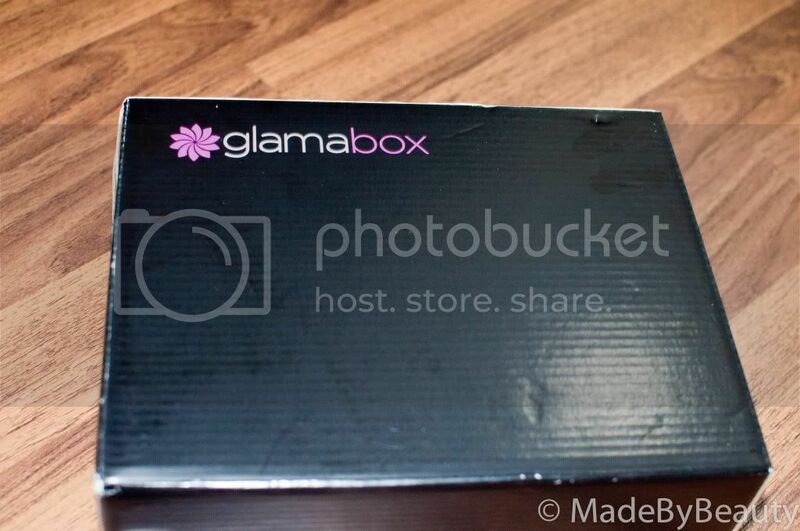 Info of the subscription programme can be found in Jan Bellabox review if you happen to be interested. And now it's time for this month's review. 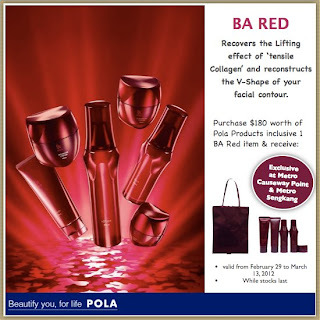 Elizabeth Arden at Robinsons Centrepoint Level 3 offers great savings on our seasonal sets. Now you can get the Beauty Treasures Holiday Color Collection at $70 and the Leopard Chic Beauty Box at $50. Every 1st 29 patrons to Kiehl's shops will receive a Skin Treatment Duo Kit worth $39 with any purchase. Promotion starts now until Feb 29. Dolly Leo offers 15% off with any £100 orders. No code needed. Valid thru Apr 6.
feelunique.com offers £3 off any £30 order with code LEAP3, £6 off any £50 order with code LEAP6, or £10 off £80 order with code LEAP10. Valid thru Feb 29. Afterglow Cosmetics offers free shipping with any purchase. No code needed. Valid for Feb 24 only. B-glowing offers free shipping and a free full size Tammy Fender Epi Peel worth $80 with any $150 purchase. Enter code Tammy at checkout. While limited supplies last. Bath and Body Works offers 20% off any purchase. Enter code ENJOY20 at checkout. Valid thru February 26. Beautysak offers 20% off any $40 purchase. Enter code 20FEB at checkout. Valid thru Feb 27. Benefit Cosmetics offers a free sample of new hello flawless oxygen wow foundation with any purchase. Enter code HFIVORY for Ivory I’m Pure 4 Sure, HFPETAL for Petal I’m Plush & Precious, HFCHAMPS for Champagne Cheers To Me, HFHONEY for Honey I’m So Money, HFBEIGE for Beige I’m All The Rage, HFTOASTED for Toasted Beige Warm me Up, HFAMBER for Amber I’m So Glamber, HFHAZEL for Hazelnut I’m Hopelessly Hot, or HFNUTMEG for Nutmeg Gotta Know Me. Valid thru Mar 31. Bon Ton offers a Buy More, Save More promotion with purchase of beauty products. Get $5 off $50, $10 off $75, $15 off $100, $20 off $150, $30 off $200, $35 off $250, $40 off $275, or $45 off $300 with code WPBUYMREF12 at checkout. Valid thru Feb 25. Carol’s Daughter offers a free Healthy Hair Butter worth $11 with any $40 purchase. No code needed. Valid thru Feb 26. Chantecaille offers free shipping and a free full size Lip Brush with any $150 purchase. No code needed. While supplies last. Clinique offers free shipping with any purchase. No code needed. Valid thru Feb 25. Choose one deluxe sample at checkout. Cosmetic America offers 10% off with any $25 order. Enter code V42P3. Or $10 off any $85 order with code G8X62. Valid thru Feb 29. E.L.F offers 50% off any purchase of Studio line. Enter code ECD21 at checkout. Valid thru Feb 25. H2O Plus offers all Bath Basics are 3 for $20. No code needed. While supplies last. Hautelook has a Lorac sale event today. Juice Beauty offers free shipping and a free full size Exfoliating Cleanser worth $22 with any $50 purchase. Enter code EXFOLIATE at checkout. Valid thru Feb 27. 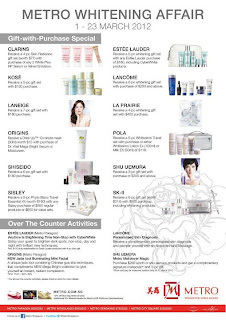 La Mer offers free overnight shipping with any purchase. Enter code POTENT at checkout. Valid thru Feb 26. Lord and Taylor offers free shipping and a free 6-pc gift set with any $50 Philosophy purchase. Gift includes Supernatural Lip Gloss, Eternal Grace Shower Gel Foil, 60ml Purity Facial Cleanser, 12ml Hope in a Jar, 12ml Microdelivery Enzyme Purifying Peel, and a pink cosmetic bag. No code needed. While supplies last. MAC Cosmetics offers free shipping with any purchase. Enter code LIGHTFUL at checkout. Valid thru Feb 26. Perricone MD has an online Warehouse Sale, select products are up to 50% off. No code needed. Valid thru Feb 26. Pur Minerals offers free shipping with any $25 purchase. Enter code AFF25FREE at checkout. Valid thru Mar 1. Pur Minerals offers 20% off any skincare purchase. Enter code SKINCARE20 at checkout. Valid thru Mar 1. Pur Minerals offers $20 off any $60 purchase. Enter code 20OFF60 at checkout. Valid thru Mar 3. Scentiments offers 10% Off with purchase of their clearance section, which leads to up to 78% off. No code needed. While supplies last. Sephora offers a free deluxe sample of Make Up Forever Smoky Lash with any $25 purchase. Enter code REBELLIOUS at checkout. While supplies last. Shu Uemura offers free shipping and a free hand made portable natural eye liner brush worth $20 with any $65 purchase. Enter code EYEBRUSH at checkout. Valid thru Feb 28. Smashbox offers a free full size Photo Finish Lid Primer worth $20 with any $65 purchase. Enter EYEPRIME at checkout. Valid for Feb 24 only. Spalook offers a free full size Basil and Grape Hand Cream worth $14 with any $25 MOR purchase. No code needed. While supplies last. Tarte is having a Sample Sale, select products are up to 60% off. No code needed. While supplies last. Tarte offers 15% off any $75 purchase (sample sale excluded). Enter code FEB75 at checkout. Valid thru Feb 29. The Body Shop offers Buy More Save More promotion. Purchase 5 items get 50% off; purchase 4 items get 40% off; purchase 3 items get 30% off; purchase 2 items get 20% off; purchase 1 item get 10% off. No code needed. Valid for Feb 24 only. Walgreens offers 15% off with any purchase. Enter code SITEWIDE15 at checkout. Valid for Feb 24 only. Whish offers 25% off with any purchase. Enter code feb12 at checkout. Valid thru Feb 26. Yves Rocher offers free shipping and $10 off with any $30 purchase. Enter code AWARD10 at checkout. Valid thru Feb 26. I'm having the first ever giveaway, yeah, excited =) The prize is the following Beauty Credit Somang Gift Pack, including deluxe samples of 3pc set (toner/lotion/cream) from their ecopure collagen, RG-II, coenzyme line, and 2pc set (toner/lotion) of their Aloe Vera line. The giveaway is open to worldwide readers, just join using the widget below =) But please remember to scroll down to read detailed terms and conditions ya. Bare Minerals offers a free limited-edition Precision Eye Defining Brush in Pearl with any purchase of bareMinerals READY eyeshadow. Enter code READYBRUSH at checkout. Valid for Feb 23 only. Beauty.com offers free bareMinerals Skincare Duo deluxe sample with any $10 purchase. No code needed. Click the link to active the offer in your cart. BioElements offers a free 30ml travel size Makeup Dissolver Perfected with Get Clean Duo purchase. No code needed. While supplies last. Bliss offers a free Totally `Skinż Love kit with any $75 purchase. Use code LOVELY at checkout. Valid thru Feb 29. Bliss offers a complimentary sample of the sweep facial exfoliator with any $125 remede purchase. Use code LRSWEEP at checkout. Valid while supplies last. Bliss offers up to 30% off on perfectly paired Bliss and Remede duos. No code needed. Valid thru Feb 29. Bliss offers a complimentary sample of the tri-enzyme resurfacing facial wash with any $120 elemis purchase. Use code ELEMISRFW at checkout. Valid while supplies last. Bobbi Brown offers free shipping and 7ml deluxe sample of Hydrating Face Cream with any order. Enter code BRIGHT12 at checkout. Valid thru Feb 27. Boscia offers free Travel Trio with purchase of any 2 full size products. Gifts worth $42 include Oil-free Daily Hydration SPF15, Purifying Cleansing Gel, and Recharging Night Moisture. Enter code Travel2012 at checkout. Valid thru Feb 27. Folica offers 20% off items from Folica's Top Ten lists. Enter TOPTEN20 at checkout. Valid from Feb 25 thru Feb 26. Jurlique offers a free Jurlique beauty bag with purchase of Clarisonic Mia in Lavender at $119. Beauty bag's content includes travel-size Rosewater Balancing Mist, Skin Brightening Essence, Moisture Replenishing Day Cream, and bonus samples of Skin Brightening Regimen. No code needed. While supplies last. Korres offers a $70 valued new Goddess Glow Collection Kit for Complexion for $42. Lancome offers 5 deluxe minis and free shipping with any $45 purchase. 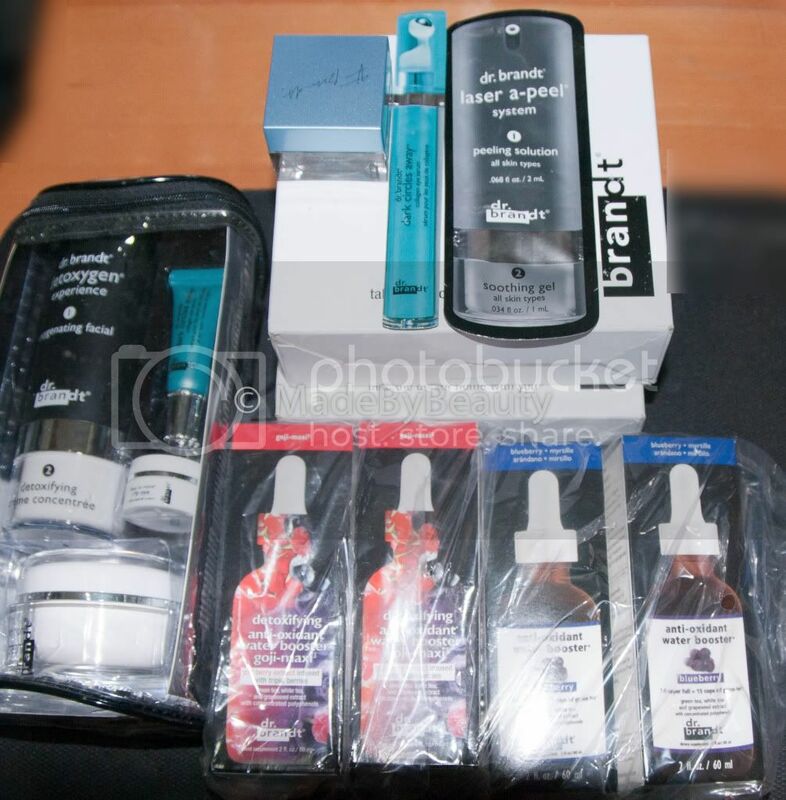 Gifts worth $131 includes 60ml Creme Radiance Cream-to-Foam Cleanser, 15ml Bright Expert Dark Spot Corrector and Radiance Activator, 15ml Renergie Lift Volumetry SPF15, 7.5ml Renergie Lift Volumetry Eye, and Hypnose Doll Lashes Mascara. Enter code FEBDLUX at checkout. Valid thru Feb 27. Ole Henriksen offes free 30ml Pure Perfection moisturizer worth $35 with any $75 purchase. Enter code REFINE at checkout. Plus you can choose award-winning micro mini peel deluxe sample packette worth $12 at checkout. While supplies last. Luxola offers a free Becca Shimmering Skin Perfector in Opal 15ml with any Becca orders over $75. 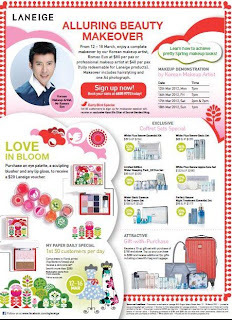 Murad organizes a Private Tea Party this Saturday Feb 25 at BHG Bugis. Recieve 20% off all purchase, plus goodie bags and GWPs. Details below. 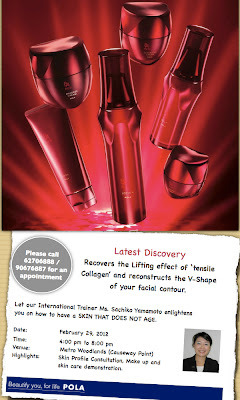 Shiseido offers attractive GWPs with launch of their Makeup Spring/Summer 2012 collection from Feb 24 to Mar 1 over Robinsons. Details as below. Bare Minerals offers free shipping with purchase of Redness Remedy Treatment at $27. Enter code REMEDY1 at checkout. Valid today only. Beauty.com offers a free deluxe sample of Murad Hydro-Dynamic Ultimate Eye Moisture and a cosmetic bag worth $30 with any skincare purchase. No code needed. Click on the banner at their homepage to activate the offer. Beauty.com offers free full-size Laura Geller Face Powder worth $31 with any $15 purchase. Click on the link to receive the offer. Biotherm offers free shipping with any $50 purchase. Enter code SHIPFEB at checkout. Valid thru Feb 24. Bloom.com donates 10% of Feb sales from Shades of Red products. Bobbi Brown offers free shipping and a free deluxe sample of Hydrating Face Cream with any purchase. Enter code BRIGHT12 at checkout. Valid thru Feb 27. E.L.F. offers BOGO 50% off with your purchase. Enter code ECD17 at checkout. Valid for 48 hours. 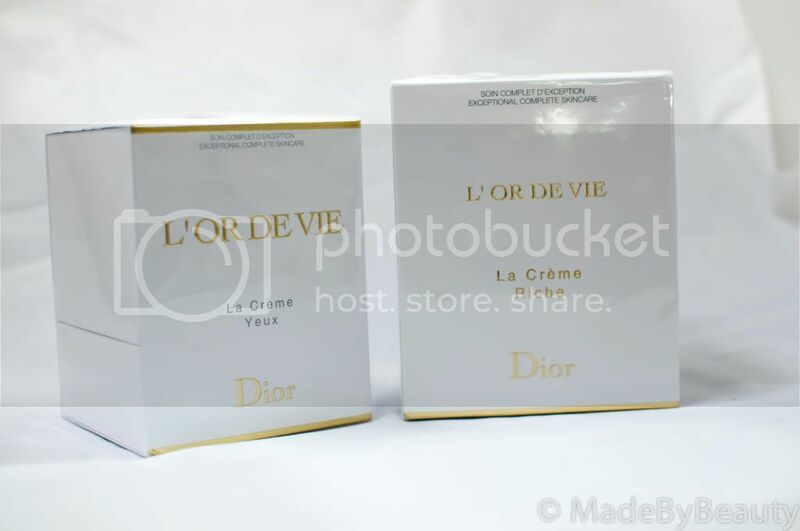 Fresh offers free Citron de Vigne Eau De Parfum and Brown Suger Body Cream with any $100 order. Enter code LIPS at checkout. Valid thru Feb 23. Juice Beauty offers free shipping and $25 off any $100 purchase. Enter code AGELESS25 at checkout. Valid thru Feb 24. Kiehl’s offers free shipping with any $35 purchase. Enter code FEBGIFT at checkout. Valid thru Feb 26. L’Occitane offers a free gift set worth $44 with any $75 purchase. Set includes 50ml Immortelle Brightening Cleansing Foam, 15ml Immortelle Brightening Hand Care SPF 15, 15ml Immortelle Brightening Moisture Cream, 75ml Cherry Blossom Shower Gel, 15ml Cherry Blossom Hand Cream, and a cosmetic pouch. Enter code SPRING at checkout. Valid thru Mar 18. La Mer offers free shipping and a sample of the Moisturizing Gel Cream with any purchase. Enter code POWER at checkout. Valid thru Feb 26. Murad offers $25 off any $100 purchase. Enter code SAVE25 at checkout. Valid thru Feb 21. Mario Badescu Skin Care has extended their offer of free shipping and a gift set worth $25 with any $50 purchase. Enter code PDAY. Valid thru Feb 21. Ojon offers free shipping and two free deluxe samples with any $50 purchase. No code needed. Valid thru Mar 5. Perfume.com offers 10% off any purchase. Enter code HONESTABE at checkout. Perricone MD offers free shipping and 15% off with any purchase. Enter code PERSONAL15 at checkout. Philosophy offers free shipping and a free philosophy tote with any $50 purchase. Enter code tote4me at checkout. Valid thru Feb 24. Shiseido offers free shipping and free travel sizes of Future Solution LX Extra Rich Cleansing Foam and Future Solution LX Concentrated Balancing Softener with any $100 Future Solution LX purchase. No code needed. Skincare By Alana offers free shipping with any purchase and a variety of GWPs with $25, $50, $75, $100 and $125 purchases. No code needed. Time to Spa offers $20 off with any $60 purchase. Enter code BIGTHANKS at checkout. Valid thru Feb 26. Too Faced offers Shadows of the Night 7-pc Makeup Collection worth $95 for $60. Plus choose 3 deluxe samples with any purchase at checkout. ULTA Beauty offers free shipping with any $25 purchase. Enter code SHIPFEB12 at checkout. Valid thru Feb 25. Yves Rocher offers all beauty treats at $5 Max and addtional 20% off with any purchase. Enter code 20OFFNOW at checkout. Valid thru Feb 26. Illamasqua offers free standard UK shipping with any order, and free international delivery with any £50 purchase. Enter code FREEUK02 for UK shipping, and INTERNATIONAL50 for international shipping. Valid thru Feb 28.